Here is my entry into Beates sketch challenge. I just bought these Tiger Lily flowers by "Imaginisce" today and just had to use them! The stamp I used is from "CTMH" and it is called "Make my day" and thought it was perfect for this layout. The patterned paper I used is from "Paper Pizzazz" and I just love all the purple and yellow and pink flowers! The cardstock I used I bought at Kelly Paper, It is textured and adds a certain something! Enjoy my art and let me know what you think! 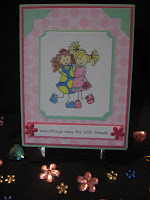 Here is a card that I made using "Bubblebella" From Stamping Bella. I used a crystal lacquer on the bath tub to give it that porcelain look and some stickles to the bubbles. Lookin cozy!! I am sending this Beates way for her weekend sketch challenge #40! Sooooo much fun! I haven't posted in a while so I thought I would share this darling card that I just kinda threw together. 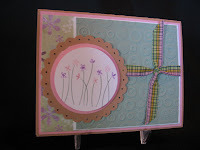 I just love my Bella stamps and this is one that I recently added to my collection. It is called "Best friends forevah" If you have ever checked out the Bellas, don't wait any longer. The are the funnest! I used a SU! designer paper in pink and white circles and my photo corner punch from SU! The flower brads are called Watercolor brite flowers from Making Memories. 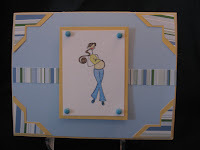 Here is my card for beate's sketch challenge #39. This was a fun card to make. I have so much paper that I thought it was about time to use some of it! I am constantly buying paper! Lovey luv luv it! 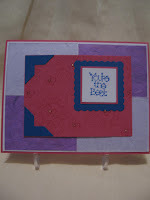 The stamp set I used on this card is " Just like you" from Stampin up! Cardstock used is creamy caramel, pretty in pink,whisper white and sage shadow I havent the slightest idea what brand the paper is. I embossed the Sage shadow with my spots and dots EF and added some dollar ribbon from Michaels. 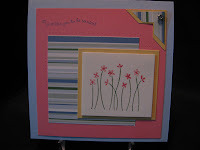 Here is a card that I made using "Pregabella from "Stamping Bella" I made this card for my Boyfriends mom. She is giving it to a lady and her husband who just found out they are having a boy! I used SU! Bashful Blue, So saffron and whisper white cardstock . I also used a designer paper from SU! and last but not least, The SU! photo corners punch. I am so loving that punch! 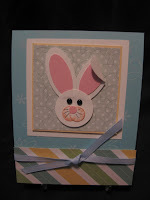 Here is a card that I made for my March DTP(Direct to participant) swap. I make 5 identical cards and send them to 5 people on the list. It is a fun swap to be in. I try to do it every month, depending on how many swaps I am in for the month. I used "Just like you" stamp set from Stampin Up! and Bashful blue, regal rose and whisper white card stock and Stampin designer paper and my photo corners punch from Stampin Up! I topped that of with a circle rhinestone! 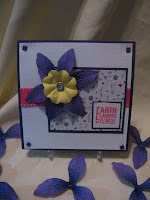 Thisis a card that I made at Gina Taylorsstamp camp! Isnt this the cutest?Ginahas some of the coolest projects that we make at her stamp camps and for any holiday she always has special little goodies for all of her attendees. We used the 1-1/4 circle punch, large oval & small oval, 1/2 in. circle punch, and a large hand held circle punch. Black eyelets for the eyes. We used pretty in pink, Whisper white, barely banana and I think it was Soft sky Cardstocks. What springy colors! Here is another of Beates sketch challenges. These are so much fun to do and It helps me to "look outside the box"! I bought this really cool mulberry double sided cardstock with purple on one side and a very light purple on the other side. The colors I used are Rose red, Brilliant blue and Whisper white CS. 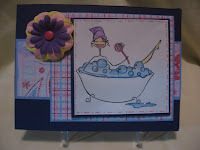 I stamped the front rose red piece with "Doodle this" and the saying stamp is one from CTMH that I have had for years. Go and check out Beates blog "Fresh and Fun" and her sketch challenges and other goodies to get those creative juices a flowin!